In anticipation for the new Star Wars films, the Star Wars media team has been posting the original trailers for the original Star Wars films to YouTube. The Star Wars trailer and the Empire Strikes Back trailers are odes to a bygone time where every trailer was painstakingly narrated by men with serious voices. You guys are just trying to make me use My Little Pony screenshots on all these posts, aren’t you? Mandydax pointed out last week that our listeners should be “owl-eared”, not “eagle-eared”. She is, of course, completely correct. Here’s what our owl-eared listeners picked up this week. Wow, that never even crossed my mind. Wow, that’s close, too. Also, the fact that the phenomenon is called a “wolf whistle” links the call back to canines… wow. I couldn’t find a history of herding whistles, but it seems that each dog often has a different set of whistle commands, so when multiple dogs are working together they don’t get confused. Thus, the whistle heard above isn’t necessarily the same whistle used for different dogs. Thus, I agree with Wdononue that the sailor story is probably a more likely origin for the wolf whistle. However, this may still be part of the story. I couldn’t find a clip of it online, but I do remember catching the Wilhelm when I saw Lockout in a theater in West Virginia. According to IMDB, the scream happens when an inmate trips and falls right after coming out of stasis. And finally, here’s one I found. It seems that OH!3 recorded a song called “Starstrukk” that is almost entirely predicated upon the wolf whistle. Clip and full video below. Warning: Katy Perry content. Our eagle-eared correspondents are wild for the Wilhelm Scream this week! That is indeed a Wilhelm Scream! A cursory glance at YouTube suggests that there are Wilhelms all over the place in God of War III. Pirates for Sail covered “Rock Lobster”, and the scream shows up at the very end of the track. Yar! I couldn’t find a clear sound bite from Command and Conquer online, but a lot of people on the ‘net have heard the Wilhelm in the game. From what I can gather, the game features a lot of screaming. 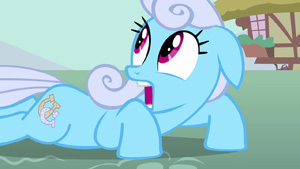 The Wilhelm apparently shows up all over the place in MLP:FIM. This video points out three instances. 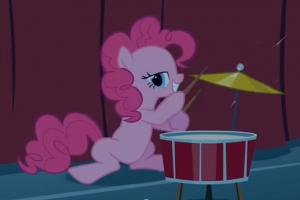 I knew it was only a matter of time until MLP:FIM showed up in a post here. I know for certain that I’ve heard the Villains Theme in Looney Tunes, too, but I’m having a hard time finding exactly where. Surely this means I need to rewatch all the Looney Tunes cartoons. Oh, tragedy! 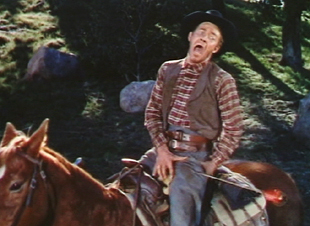 One of the most famous of all recycled sounds is the so-called Wilhelm Scream, a sound effect found in over 225 films and counting. It first appeared in the 1951 Gary Cooper vehicle, Distant Drums, though the scream was named after the arrow-caused demise of Private Wilhelm in 1953’s The Charge at Feather River. The sound effect has popped up every few years since then, but it became something of a sound effect in-joke after sound editor Ben Burtt used it in Star Wars and many other films he did since then. The likes of Quentin Tarantino and Peter Jackson have further picked up the joke and carried it forward. It is not certain who voiced the famous shriek, but research seems to point at Sheb Wooley, the man who sang “The Purple People Eater“. Wooley played an uncredited role in Distant Drums, and he frequently did such voice work. Now that the Internet has been cataloging appearances of The Wilhelm Scream for years, many seasoned film watchers easily catch a new Wilhelm appearance. However, what most people don’t realize is that the sound most often called the “Wilhelm Scream” is only one of six screams, and that all six are referred to as “Wilhelm”. The series of six takes were recorded together as “man being eaten by alligator”, and all six crop up in films from time to time. Yet it is undeniable that Take 4 has won the hearts of sound designers, to a point where I’ve heard folks complaining that the Wilhelm Scream is now too ubiquitous. The sound is now so easily recognizable that it can distract an eagle-eared cineast from the urgency of a film’s action scene. However, I have a deep love for the Wilhelm, because it reminds us that the art of a sound minion is usually invisible: if it is done well, you don’t notice it. The Wilhelm is a little aural stamp that reminds us that all that sound has to be created, too. Here’s a video starring the guy who wrote the history page listed above, during which he plays all six Wilhelm screams. Here’s a great list of Wilhelm Screams, which includes detail on which scream was used in each film. Want to see the Wilhelm Scream in action? Here’s a great, 12-minute-long compilation of film clips. Check the notes on the video for film titles. Have you spotted a Wilhelm Scream in the wild? Let me know! The Sound and the Foley celebrates those sounds everyone knows, but nobody seems to know why.